Lately, I've been on a roll about Oakland because, frankly, I love my city. San Francisco may have my heart, but Oakland has my soul, and that may well be the more important of the two. Oakland is in the midst of a renaissance. I mean, why buy a $500K studio in the city, when you can get a great loft or even a house for that much in the East Bay, especially with BART as an option for transport? The truth is, I get downtown faster than my friends who live in the Avenues, or even Noe or Cole Valleys, sometimes. Anyway, every time I'm driving through downtown on Broadway or Telegraph, I'm blown away by the Art Deco architecture that surrounds me; a few blocks east, and the fourth largest Chinatown in the country beckons; a few blocks west and Old Oakland beckons. It's the latter that I write about this week on KQED -- go ahead, check it out. 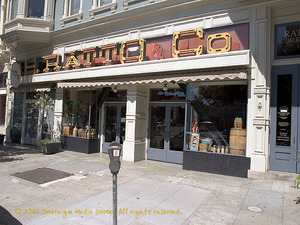 I hope you'll be inspired to spend a lazy afternoon in this charming enclave of the jewel of the East Bay. It's not often that I get the first scoop on a restaurant, but thanks to C's good eye, we discovered this place early. Located on a pretty block in Old Oakland, Tamarindo, a "place of little cravings", offers up regional Mexican dishes in a small plates format. The space is a small but gorgeous store-front, with seating for about 25, and architectural details aplenty. Beautiful lighting could be turned down a notch for more ambiance, but the exposed brick and large artwork set the mood nicely, otherwise. Tamarindo's Sangria was excellent -- not too sweet, with small diced fruit, a more refined take on a rustic beverage. This Just in from Luka's! Luka's is now open for Brunch every Sunday from 10:00 a.m. until 4:00 p.m. Chef Alioto takes Luka’s menu and adds a southern American culinary twist with dishes such as fried chicken, waffles, and biscuits & gravy. Meanwhile, DJ Wisdom spins soul music favorites from Memphis to Motown and points beyond every Sunday beginning at 12 o’clock. Truthfully, I wish that Luka's would go a different route than chicken & waffles (since there's already a great C & W place in Jack London Square), but beggars can't be chooser, an I'm going to guess that these are going to be some dressed up southern breakfasts. Regardless, my crew and I are heading there this coming Sunday, and can't wait to report back. I've previously reported on Luka's here and here. 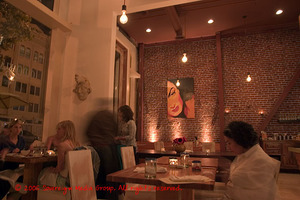 Alice at Epicurean Debauchery wrote about our dinner at Luka's here. I love Meathenge's current Uncle Wiggly contest -- "Version Weekday." We have a a few standbys for weekday meals when neither of us has the energy for standing at the stove for too long or even for going out. I'm going to feature two "meals" in this post because, frankly, I couldn't pick between them. 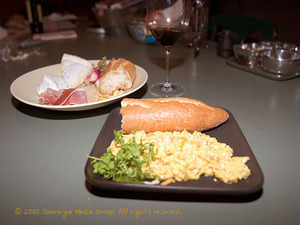 First is a combined dinner of Scramble & Charcuterie -- C usually makes the scramble while I assemble the charcuterie/cheese plate. No further details on this one as I think it's pretty self-explanatory, and completely personalizable to your own taste. The second is a simple seared Rib-eye Steak for 2 With Smashed Potatoes & Swiss Chard. This dinner takes less than 30 minutes from start to table, and can be made with any steak cut that's about 1" thick. Start the potatoes first, then the chard and finally the steak. We generally drink this with a quaffable Burgundy or, in the winter, a richer Bordeaux or Cabernet. 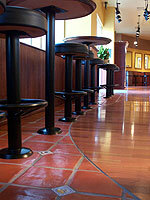 When I worked in the city, I had lunch at Specialty's (the Montgomery Station location) several times a month. The sandwiches are creative (I had my first turkey sandwich with cranberry sauce here, and I still love their Vegan sandwich), the salads fresh, and really, is it necessary to say anything about a cookie hot from their oven? Well, I'd been doing without for nearly a year when C, who works a mile from me, called me from lunch one day. "You drove all the way to the city for a sandwich?" "No, there's one in South San Francisco. In the Actuate building in that weird business park... um, didn't you know?" You can imagine the tantrum that ensued, dear reader. Here I'd been eating sub-par sandwiches (well, the Happy Hoagie makes a fine sandwich, they're just pretty basic), mediocre, wilting salads and nary a delicious fresh-baked cooking in sight! All while there was a Specialty's a mere 3 miles away!! Fortunately, I've since discovered Specialty's Direct, whence one can place an order (complete with full customization functionality -- eg, "no anchovy on my small caesar salad, please but extra chicken and pack it in the large container"), add on a cookie, pay with a credit card and specify a pick up window. As I sit here finishing off the last of my dense, chewy, nearly brownie-like black and white cookie (now, don't you purists go getting excited. It's not a real b&w -- it's more a dark chocolate cookie with white chocolate chunks), I can't help but be thankful that the fine folks at Specialty's decided that enough corporate drones had moved south to warrant a secret little outpost of our own in lovely South San Francisco. I have a routine on Thursday mornings. 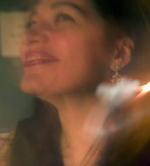 It's one I treasure, and one that has been something of a secret between C and me. 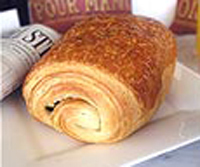 Before work, we stop at La Farine for a chocolatine (aka pain au chocolat). On the drive to the office, the smell of deep, rich chocolate and buttery pastry fills the car, and my belly, with anticipation for the first bite. I drop C off at his office, and as soon as he's out of sight, I sneak a little nibble from a corner of the pastry. Is it eggy this morning? Is the outside "skin" so crisp it shatters? I drive to my office and park the car. Before getting out, I take another bite -- a way to fortify myself against the onslaught of emails and voicemails and questions that's about to begin. I come in. I sit down at my desk and, as my laptop powers up, I fetch a large mug of boiling water. Drop in the tea ball, now filled with leaves of Earl Grey (whoever knew that Earl Grey and chocolate were such fine bed buddies?). I open Outlook. As expected, there are dozens of emails. I close my door. I sit back, and enjoy the remainder of my chocolatine and tea. Now, I can start my day. No, this post isn't about diets or opera. It's about a cute little place in Jack London Square, housed on the site of one of Oakland's first brothels, built in 1884. Supposedly named after the madame who ran this busy "house of ill repute", The Fat Lady is now owned and operated by three generations of the Shaterian/Rossi family. The interior of the restaurant is loaded with gorgeous paintings, red velvet, stained glass and plenty of tchotkes. The bartender will sometimes give you a little tour of the bigger things set around the bar, if you ask. The menu is firmly rooted in standard upscale American fare, with a smattering of Armenian & Mediterranean flavors. The wine list is very simple and short, with a few reliable options. N started with The Fat Lady's Famous French Fried Zucchini. This absolutely delicious rendition featured slender curls of cornmeal battered zukes dusted with fresh-grated parmesan cheese, and didn't even need the dipping sauce it came with. C had their Dungeness Crab Cakes, a real departure for him. They were awesome. Three decent size cakes, incredibly light in texture (my biggest complaint of crab cakes is that they are too often very dense), with delicious crab flavor. I had the Fat Lady's House Paté, a smooth, deeply flavored paté of chicken liver, walnuts and cognac served in a ramekin with toast points, cornichons and cured olives. Very tasty. I hate writing negative reviews, and really try not to do so after a single visit to a place. But last night, we had a dinner that left me asking (for the first time in a long time), "why do I feel bilked out of $150??" The evening started off nicely at the bar with a round of Lillet for C and me, a vodka-tonic for O and an Arnold Palmer for K. As we were shown to our table, we all commented at how pretty the dining room is, and how calm. Our waitress for the evening was lovely and explained a few specials to us -- I particularly liked that she advised us of prices for the specials without having to be asked (some of you may remember that this is a particular pet peeve). After we got caught up, and had figured out what everyone was eating, I turned my attention to the wine list. The list was definitely skewed to the Californian, despite the chef's cuisine definitely having its roots in France. The Burgundy section was way out of our price range, as were most of the European wines. I did spy a bottle of '96 Luigi Righetti Campolieti Valpolicella for $45, which seemed pretty reasonable, and ordered that. Here, our problems began. I have a confession. Yesterday's picture? If you frequented the Gastronomie Forum, you'd have known exactly what the picture was of -- I gave it away in a thread I started Monday night. 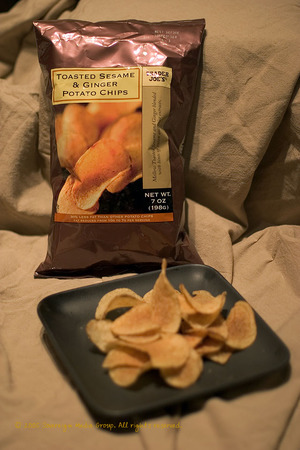 Trader Joe's has recently started carrying a line of gourmet potato chips. A couple of the flavors are somewhat traditional (Roasted Garlic & 3 Cheese, Goat Cheese & Fine Herbs), but the Toasted Sesame & Ginger chips (above) are, frankly, brilliant. A little bit sweet, a little bit savory, salty and unbelievably fragrant, these chips are about as unique a chip I've ever had. 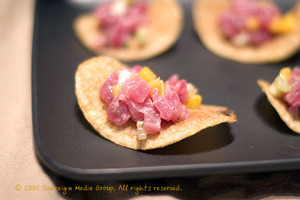 I used them as a base for a gorgeous Tuna Tartare, but they'd be equally at home alongside a Seared Tuna Burger. 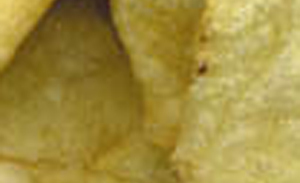 Well, here's another one... Answer to be revealed tonight at 11pm PST. Prize for this one is kind of fun: I'm going to treat you to one of these!